Create Your Own Online Backup Service With SparkleShare: Do you want to build your own online backup service like Dropbox and host your own files or data? If yes, then perhaps you should take a close at SparkleShare. From its project website, SparkleShare is described as a syncing and collaboration tool that is designed to make sharing documents and collaboration effortless. It allows you to easily host your own service so that you are always in control of your data. 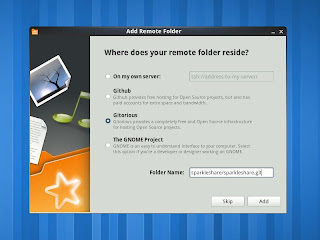 With SparkleShare, you are given an option to host your remote folder on Github, Gitorious, The GNOME Project, or on your own server. Sharing files is as easy as drag and drop Dropbox-style when using SparkleShare. Your files are synced to your server allowing connected clients to view the changes. If you made a mistake, it is still possible to revert the changes. 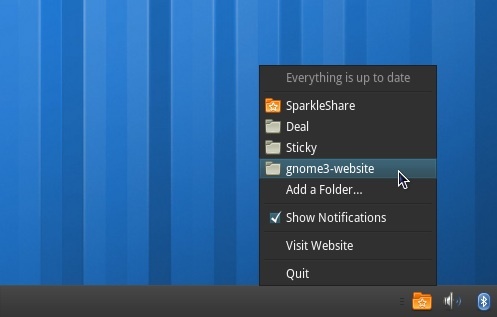 The best thing about SparkleShare is that it is totally free and open-source. It is currently available for Linux and is still in Beta. Take note that it is pretty much a work in progress and some of the features are not yet well implemented. But, a lot of people are already excited about it so I'm hoping that it is being developed at a rapid pace. If interested, you can download SparkleShare HERE. You can also read its documentation HERE. Thanks for sharing. I may need a software application like this one in the future. Good luck to the SparkleShare project and more power! I hear of Dropbox but i have never given it a spin because i use one called Safecopy backup.It is also cool. Dropbox,SafeCopy,SugarSync,Mozy,Carbonite,Backblaze are all good online backup systems.At least i have tried them out. The value add to these articles are the comments section where people have used some of the products they are recommending. I am using a service right now and have over 1500 users whoa re backing up thier data. It is costing us 20k per month. I think I could purchase a SANS and have our users have thier backups pused to this sort of setup. The problem may come when you need granularity and also if I have this soultion hosted at one datacenter then I put all of my eggs into one basket. I could replicate to another datacenter but now I am back to spending 20k per month.